Captain Dave started as a mate working for local charter boats in the area in 1986 and has also worked on commercial fishing vessels. He has been operating Magic Sportfishing since 1999. First mates Donnie, John, Allen, and Captain Rick are avid fisherman and take the time to teach you tackle and technique for the day's trip. 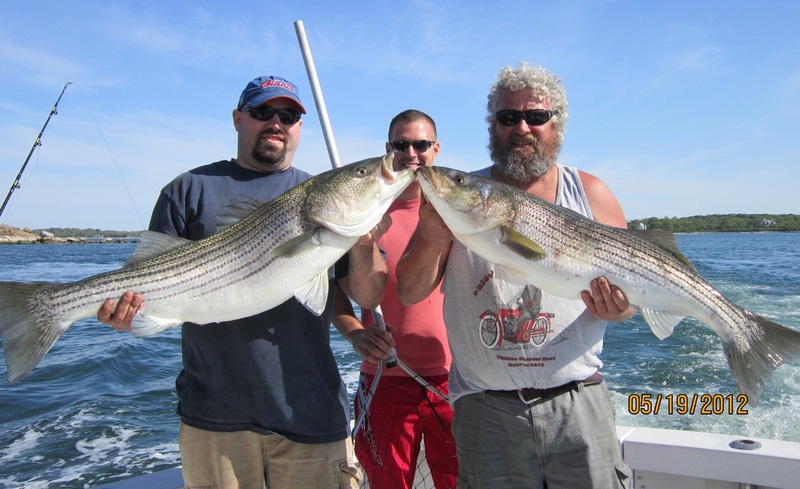 They will ensure that your catch is expertly landed and perfectly filleted. The crew of Magic Charters enjoys fishing as much as our passengers do and you'll always get 100% effort out of the Magic Charters' Crew. Come fishing with us aboard our vessel, Fin-ominal, a 38-foot Harris Cuttyhunk Sports fisherman, custom built for New England waters. We have all the latest electronics for your safety and for finding fish. Radar, V.H.F. Radio, GPS, Fishfinder, Cellular phone plus all Coast Guard required equipment. We supply all the tackle needed to catch good eating fish for the table or to land that "Big One" of your dreams. All fish are filleted, bagged, and iced to preserve them for the ride home. Take a day off from your normal routine and spend the day with us where you can relax, catch some fish, and have some fun. The boat has galley, full head, and sleeps 4-6 comfortably. All tackle and gear is supplied. Ask about our taxidermy services for that "fish of a lifetime."